Monday was the deadline to register to vote in the November 6 general elections and it didn’t surprise Election Office staff to see a surge in people coming into register on the deadline. About 200 new voters were registered yesterday. 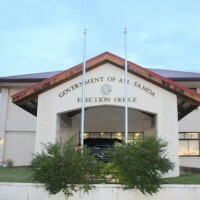 According to Chief Election Officer Uiagalelei Dr. Lealofi Uiagalelei the number of voters eligible to cast ballots in this year’s election is 15,541. He says this is a significant drop from other mid term elections when the number of registered voters was close to 16,000. Candidates will receive the list of all registered voters today. Up to Monday, the number of voters who have cast ballot by local absentee, which is those voters who reside in the territory but wont be here on Election Day due to travel or other reasons, was 155. The Election Office received 27 requests for off island absentee ballots which includes voters who are in the military and those attending college. Twenty-three were from military voters and four requests were from college voters. The Election Office has received just three off island absentee ballots.